as featured in the Journal of Retirement Planning. Explains why money managers sometimes deliberately choose inappropriate benchmarks. Illustrates how proper asset allocation can reduce risk without reducing return. Managed (or “separate”) accounts are portfolios chosen by a money manager for an investor and held in the investor’s own account. The money manager does not have access to the portfolio assets, but instead has limited discretion to execute transactions on behalf of the investor. The main difference between managed accounts and mutual funds is that while mutual fund investors hold shares representing a stake in an overall portfolio, they do not actually own the securities in that portfolio. But because a managed-account investor owns the stocks and bonds outright, the holdings can be tailored to match that investor’s particular financial needs. Customization can involve asset allocation parameters, excluding particular stocks or industry sectors from an account, and tax planning such as timing trades to maximize tax benefits. Most savvy private investors want their investments to reflect their goals and objectives as closely as possible. The potential efficiencies of participating in a group or pool pale when compared to the investment and service advantages of a privately managed account. Pooled investments simply cannot achieve the important level of customization of private account service, communications, tax considerations, and investment selection. An efficient portfolio is one that provides the greatest expected return for a given level of risk, or equivalently, the lowest risk for a given expected return. Suppose you have data for a collection of securities (like the S&P 500 stocks, for example), and you graph the return rates and standard deviations (a statistical measure of the historical volatility of a portfolio). 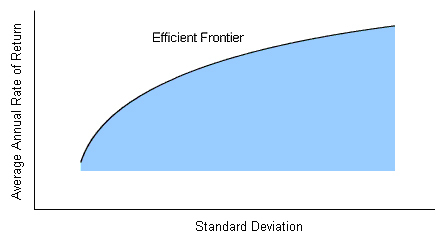 Markowitz showed that you get a region bounded by an upward-sloping curve, which he called the efficient frontier. It’s clear that for any given value of standard deviation, you would like to choose a portfolio that gives you the greatest possible rate of return; so you always want a portfolio that lies up along the efficient frontier, rather than lower down, in the interior of the region. This is the first important property of the efficient frontier: it’s where the best portfolios are.